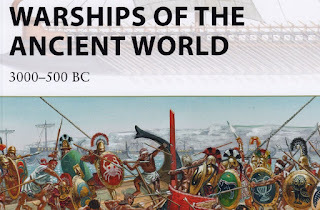 Some unresolved details from Osprey 'Warships of the Ancient World'. Plate E shows some flat drawings merely 'rounded out' to look a bit 3d. 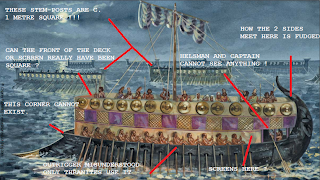 The dicrotic ship shown there has the zygian oars longer than those of the thranites ! At last achieved successful download from Osprey website. Perhaps due to living in 'The Rest of the World' it was more difficult than for others ? A slim volume at 47 pages. And slim on info. But the author tries to cover ship technology, production , use and the naval tactics and strategy of the times. It does manage to cover all this even if the evidence is thin and space limited. 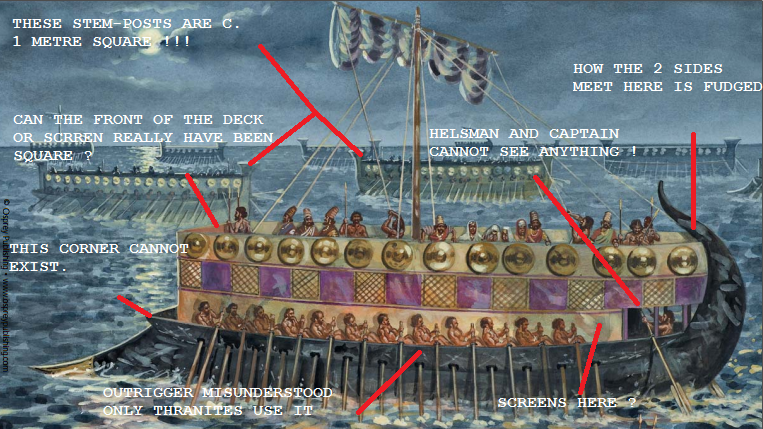 A lot of the evidence for these ships is graphical , shame so little is reproduced here. Some photos of shorescapes, nice, but some charts would have given more detail. Some of the illustrations are very atmospheric and I quite like the artist's style. However, his technical draughtsmanship is a bit off in some pictures and this is important to draw complex wooden ships correctly and believably. 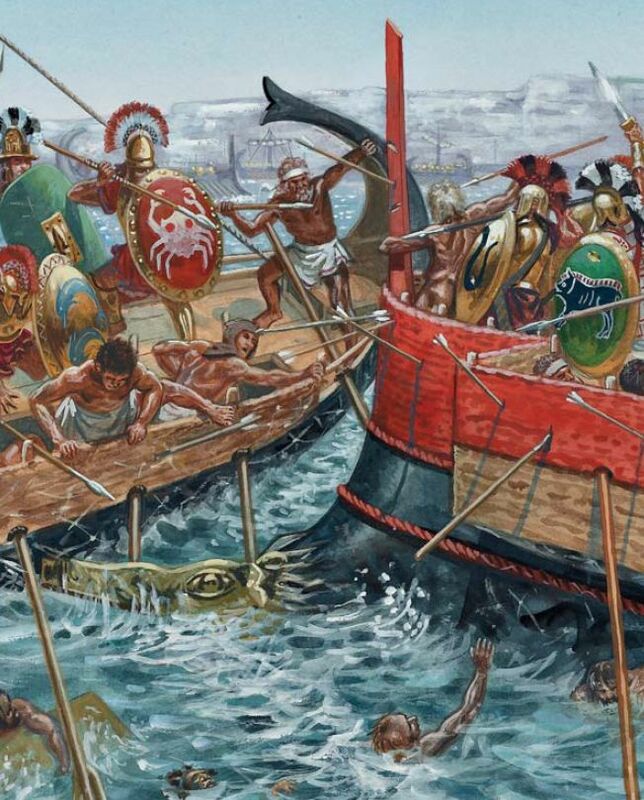 The Tyrian dicrotic warship in plate D is a confused representation, to say the least. The graceful Minoan ships are rendered clumpy and dead in plate C.
The reconstruction of a samaina - plate H-also wierd - how could that be built ? 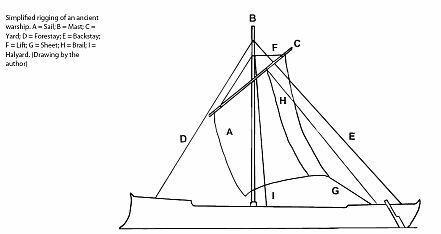 The explanation may come from an illustration of a rig for a square sail which is incomplete. This lacks a hals fore sheet, so the sail will flap and lose wind. Perhaps the author is not sure about naval architecture that makes reconstructions a bit tricky. So a patchy book with the Osprey constraints - which is also the Osprey temptation ( anyon can write one ?) - its own worst enemy again. But plate G is really really nice !!! Some of the plates will allow Junior General fans to knock up some passable ships quiteeasily. I want one for the bathtub ! 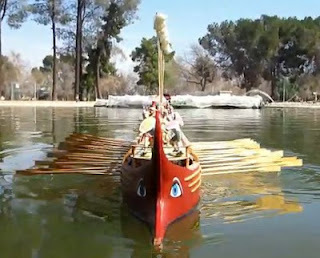 Very nice oar-powered scale model bireme ramming and sinking another ship model ! They write they plan a 'ramming game' -- with scale models in water this would be fantastic ! So I try and drag myself into the 21st century and get an ebook. 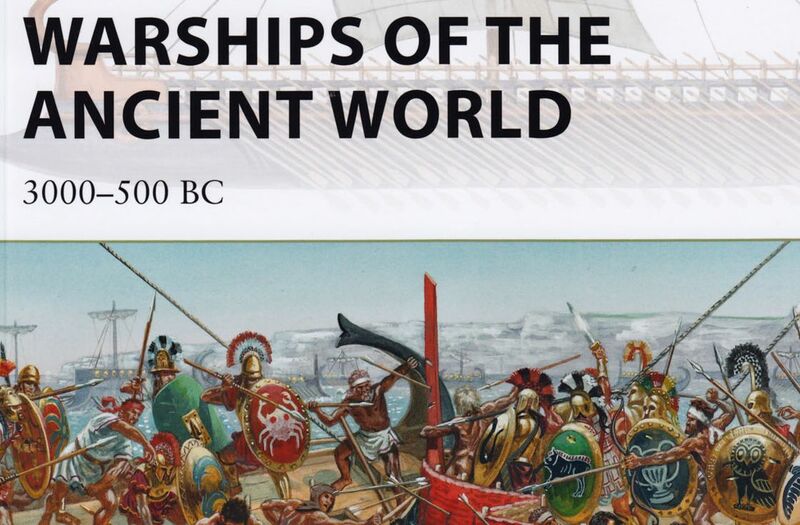 Instead of ordering a hard copy of the new Osprey 'Warships of the Ancient World' I decide to save 50& of total price and get a pdf download. BUT after 3 tries at different times I cannot get to buy one... Closest I got was a payment page giving price in american dollars. I await a reply from Osprey by email. Now I regret even thinking about betraying my love for paper books ! (but not for paper ships). A review HERE is positive. Maybe one day I will get to review my own copy ? Short animations of galleys. Very nice.